The strong Mistral gusting up to 30kts at times meant it was too windy for the first scheduled Finals day of racing at the Nacra 17 European Championships. Racing is billed to resume Friday with a start sequence planned from 1000hrs local time. There is no doubt that the Nacra 17 mixed crew catamaran will be one of the most exciting and closely watched of the sailing classes at the 2016 Rio Olympic Games. All the forecasts and historical meteo data point to a light winds regatta favouring light sailors, but didn’t they say that about Qingdao? At these Nacra 17 European Championships in La Grande Motte, France, which have so far been quite physical and breezy, in the top 16 placed after there are presently six crews with females steering. Women helms have been winning races here, notably GBR’s ex match race world champion Lucy MacGregor and Andrew Walsh, NZL’s Gemma Jones with Jason Saunders, and of course the current European champions are Mandy Mulder and Coen De Koening. Overall in the 71 strong fleet there are 24 teams with female helms. In the stronger breeze conventional current thinking decrees that the girl crews need to be increasingly stronger and fitter. 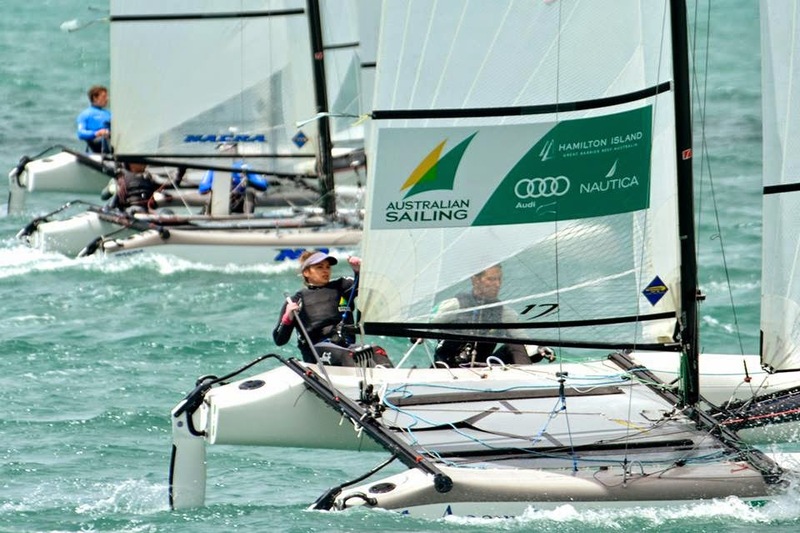 Around the boat park opinions vary as to what the likely trends are as the class moves first to its first ISAF World Championships in Santander, Spain in September and then through the Olympic cycle to Rio.